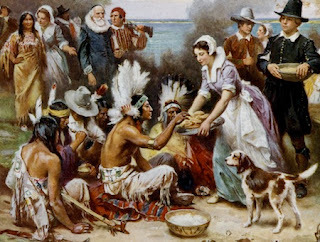 Everyone knows the official story of Thanksgiving: The Pilgrims, who had come here in search of a better life, found themselves starving. The local Indians took pity on them and taught the hapless newcomers how to farm the land. Then, following their first bountiful harvest, the Pilgrims invited the Indians over for lunch to say "thanks." And thus was born a beloved American tradition.